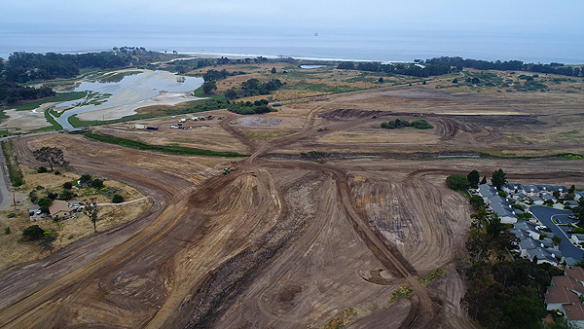 A large-scale wetland restoration project near UCSB came to be on the site of a former golf course. The leader of the project and the filmmaker of this 17 minute documentary were present at the screening. It was an opportunity to learn why wetlands are an important part of our local coastal ecology. Lisa Stratton (co-producer) has been the Director of Ecosystem Management for UCSB's Cheadle Center for Biodiversity and Ecological Restoration (CCBER) since 2005. She manages approximately 340 acres of campus open space and oversees restoration, research and training programs. Lisa received her PhD in 1998 in Botany and Conservation Biology and has lived and worked in East Africa, Hawaii and Catalina Island. She is particularly interested in restoration on the urban fringe and seeks way to integrate storm water with wetland and habitat restoration in a way that provides multiple benefits to people and wildlife. The North Campus Open Space Restoration project arose from an acute sense of the impacts of the past on this landscape and an awareness of the multiple benefits that could arise from building on the support of multiple agencies and individuals for the value of this project. Michael Love (director) grew up in Mexico City and attended University of the Americans and California Institute of the Arts. He started writing screenplays at seventeen and had his first produced credit, Oscar-nominated "Gaby a True Story," in 1987. This was followed by many other films, including ABC Network's TV Movie "Breaking the Silence" (aka "Not in My Family"), independent film "Hold it Like a Baby" (2009) and "For Greater Glory" (2012) featuring Andy Garcia, Peter O'Toole and Eva Longoria. Michael also writes screenplays in Spanish and wrote the two commercially released films "La Levenda del Tesoro" (2011) and "Extranos Caminos" (1993). He has also co-directed and produced two documentaries with former spouse Tina Love. Most recently, Michael wrote/produced and directed four natural history documentaries, "The Santa Ynez River Wilderness" (2013--Winner CCF Best Documentary Award, San Luis Obispo International Film Festival), "Bringing Back the Wild: Coal Oil Point Natural Reserve (2015), "Snowy Plover and You" (2016) and "From Golf Course to Wetland" (2017). Michael has taught screenwriting at the American Film Institute and UCSB.